promoted the idea of Ottomanization, that is, creating a homogeneous Turkey of one race, one language, and one religion – Islam. In 1913 the Turkish Ottoman government of the Committee of Union and Progress initiated a program of forcible Turkification of non-Turkish minorities. By 1914, with the new slogan, “Turkey for the Turks,” the Young Turks began ordering the confiscation of Christian property, then the wholesale slaughter and exile of Turkey’s Christian population began. Between 1915 -1917 mass arrests, heinous torture and murder of Christians took place all over Macedonia. The prominent of the towns and villages were first to be arrested and exiled to the interior, or killed outright. 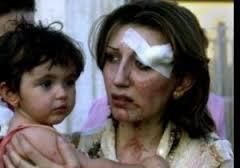 Such evil as was done to Armenian Christians at the hands of Islamic hatred has rarely been seen in the history of mankind, but then, since its beginning, Islam has been defined by its vicious inhumanity of bestial force against civilized societies. One can receive a sound education on the Armenian Genocide by going to YouTube’s various videos and documentaries on the subject. Photographs prove the horror of the truth. The cruelty and wickedness seen in pictures while ignored by the Western media is shocking – Christian clergy, professors, doctors and lawyers from Istanbul made to march through the streets with their feet nailed to iron horseshoes, 16 Armenian Christian girls crucified by the Turks. Crucified girls “Each girl had been nailed alive upon her cross, spikes through her feet and hands, only their hair blown by the wind, covered their bodies.” They had refused to convert to Islam, so were raped and crucified. Since the slaughter and annihilation of the Armenians was successful, the Turks next exterminated Pontic Greek Christians, erasing their long history from the face of the earth down to dismantling their churches, homes and villages and letting the Christians’ cultivated land and orchards go to waste. Nothing is left. No one tells that history better than Thea Halo in her book, Not Even My Name, the amazing story of her mother’s life as a Pontian Greek whose entire family was killed by the Islamist Turkish government. Thea’s mother, Sano Halo, born in 1909, recently died in 2014 at the age of 105. 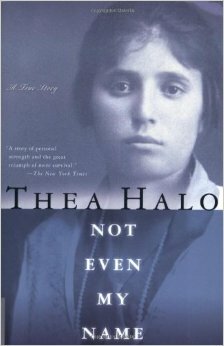 This book is recommended reading for anyone wanting to know the truth from an actual living witness uprooted from her home, and, as a child, watching everyone she loved slaughtered or dying of disease or starvation while being marched to the desert. Of those who made it to the desert, all that was left were their dried, sun-bleached bones lying in the sand. Along with 1.5 million Armenians and Greeks of Anatolia, the Ottomans extinguished 750,000 Assyrian lives and one million Greeks, Albanians, Serbs and Bulgarians. Men, women, and children were shot or hacked to pieces, their blood soaking the earth of their ancestors. Others were taken and tortured and murdered because they refused to convert to Islam. Tiny girls and women were raped, children burned to death, men castrated, disemboweled then slaughtered. Meanwhile our Muslim-friendly president, Barack Hussein Obama, is persecuting Assyrian Christian Robert DeKelaita for helping Assyrian Christians trying to escape evil at the hands of the demonically inspired religion of Islam. Today a massive sea of humanity flows into Western Europe; however not all of them are persecuted Christians and Yazidis. Most are Muslims. 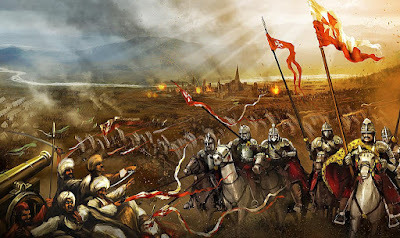 In 1683 the Battle of Vienna, instigated by the Turks for entrance into Europe proper from Asia Minor through the Balkans, marked the historical end of the expansion of the Ottoman Empire into Europe. The Islamic army got as far as Vienna where they were stopped by Jan Sobieski (a Pole) and his small army. Three hundred years later, today’s descendants of those same Europeans of yesterday are allowing Muslims into Europe thereby negating everything for which their forefathers died. Blogger Andrew Biezad (OnePeterFive) says about today’s situation, “While American and Western European governments are saying this is a ‘refugee crisis’ and the news media, like good propagandists, run images of a few poor women and children, they neglect to show the rest of the situation. Not displayed is the mass of overwhelmingly young, healthy, well-dressed males, carrying the latest smartphones yelling Allahu Akbar. These men have come to rampage, riot and destroy in the name of Islam. This is not normal migration, this is an Islamic hijra. Because of the media’s and Islam’s shared hatred of our Judeo-Christian God, the media turns attention away from today’s Christian Genocide, thereby manifesting its silence on the issue. As it concentrates on Bruce Jenner’s transgender facade with his carefully chosen lipstick color highlighting his high feminine cheekbones or some movie starlet’s “lacy look over her baby bump,” and covering up Hillary Clinton’s wiping her server clean – “What? With a cloth or something?” – today’s current genocide of Christians in the Middle East prophesies tomorrow’s genocide of the rest of us, wiping us clean off the face of the earth with the cloth of Islam. 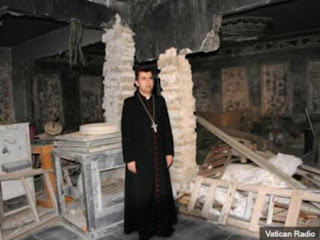 One Catholic Melkite Deacon and Islamic scholar is desperately trying to bring Christian genocide to the forefront and educate Americans as to what Islam really teaches. Sadly, his Bishop appears to be trying to silence his message. A distinguished priest who spent years in the Middle East brought this to my attention. He told me exactly what rumors were being circulated about this man's mission through the Chancery. Father's praises were quite the opposite. He said Robert is one of the foremost scholars on the subject and he could not understand why there was such animosity being leveled against him by his own! The root of all this evil appears again to be money. Faith Based "charities" established under Bush wherein, religious institutions are paid our Federal tax dollars to relocate and settle the Moslem immigrants appears to be one lucrative source for the Bishops and others. If the American populace is educated about Islam, this income source is threatened. Read about the "Business" of immigrants. flee their homes, aren't other nations offering the protection of their own military by creating "safe zones" that are defended with the full force of the military from ALL the nations that are part of the UN? The ugly answer appears to be that, rather than help these poor people where they have been planted for thousands of years , a concerted effort to demolish the historic and religious culture by socially engineering a mass migration with promises of non existent employment elsewhere has been going on. Doesn't the Vatican realize historic Christianity is under threat and the UN agenda has always been to dilute the Faith in the One True God, Our Lord and Savior Jesus Christ? Absolutely, Brian. We would simply appreciate a link back. So many people today are ignorant of history. And it's so true as Santayana said that those who are ignorant of history are condemned to repeat it. Which is exactly what we are seeing today with the rise of Islam in all its violence and the silence of those with power to do something about it. God help us. And a big thank you to Susan for this excellent post! In an interview with CFN Bishop Schneider seems to agree with your statement in last paragraph. "Migration is artificially planned and programmed"
Mr. Fülep: What is your own view about the migration crisis in Europe? What is the good Catholic attitude to it? His Excellency Bishop Schneider: "This is more or less a political issue. It is not the first task of bishops to make political statements. But as a private person, not as a bishop, I would say that the so-called “migration” is artificially planned and programmed, one can even speak of a kind of invasion. Some global political powers already prepared it years ago, creating confusion and wars in the Middle East by “helping” these terrorists or not opposing them officially, thus – in a way – they contributed to this crisis. Transferring such a mass of people, who are predominantly Muslims and belong to a very different culture, to the heart of Europe is problematic. Thus there is a programmed conflict in Europe and the civil and political life is destabilized. This must be evident for everyone."